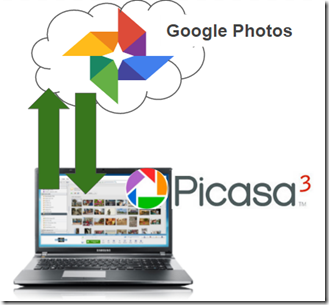 Sync photos between Picasa and Google Photos – Learn Picasa and Google Photos! This is what I do now: All my photos collect in the cloud with Google Photos, I make albums of my best photos there, then I download those albums to my computer so I have them in Picasa for safekeeping, collages, text on photos etc. Picasa can Upload to Google Photos, creating an album of photos online. 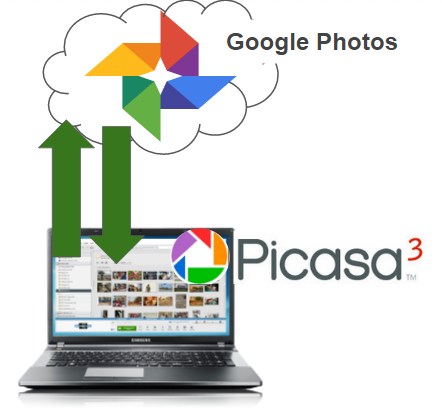 Picasa can also download Albums from Google photos online, creating folders of pictures on your computer that can even synchronize with the cloud. Select the photos you want to upload. You’ll see them in the selection tray in the lower left. We recommend Original – this will count against your storage allotment, but you can recover that space later. Selecting Best for Sharing will reduce the resolution of your photos to 2048 px. A major advantage to this method of downloading is that captions are preserved! If you added descriptions using Google Photos – those descriptions show up as captions in Picasa. This is not true when you use Google Photos download command. There is also one drawback to this method – Picasa will only download pictures that are not already on your computer. So, if some of these pictures in the Google Photos album started out on your computer, then the album download will create a folder that is missing those pictures. You can avoid this either by always uploading to the cloud first, and just downloading albums. Or, by using folder manager to limit what Picasa is seeing from your computer – fooling it, if you will, into not knowing that those photos already exist. I use this method all the time to incorporate Picasa into my photo workflow. I gather all my pictures in the cloud with Google Photos – thousands of them – then I download just the best, the ones in albums. Here are some tutorial videos related to this subject. If you’re not a member, you can join here.